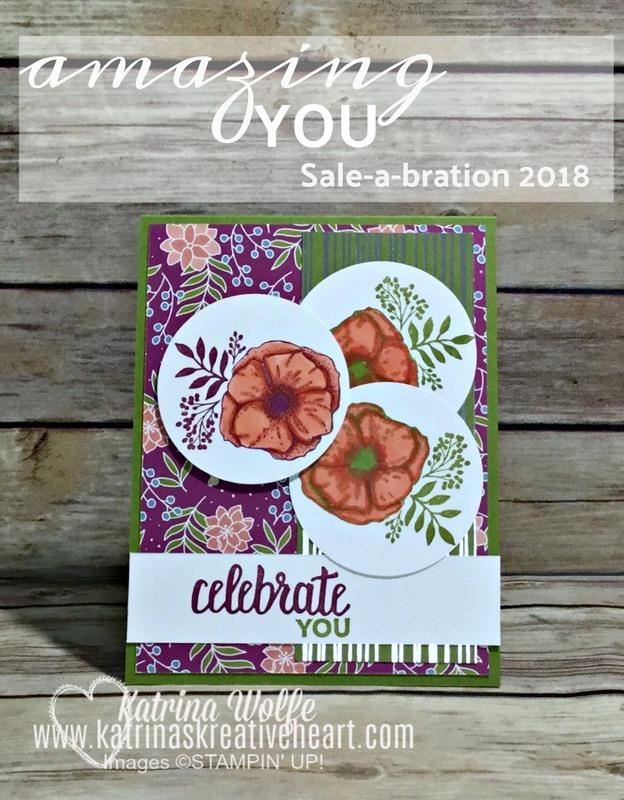 Welcome to the 2018 Sale-a-bration Kick Off Blog Hop! I am glad you could join us! As you may know, Sale-a-bration is the most exciting time of the year in the world of Stampin' Up! and today we want to share with you lots of ideas from the Sale-a-bration brochure. So, currently you are on my site, Katrina's Kreative Heart with me, Katrina Wolfe. To assist you in moving along the hop, you will notice below is the full line up and you can click the next link in line to move from one site to the next to see all of the amazing ideas using all of these amazing products that you can earn for free with a $50 or in some cases $100 purchase. Today, I am featuring the Amazing You stamp set. I absolutely adore this set. This mix of fonts for the sentiments in this stamp set are just amazing. I pulled my colors from the Designer Series Specialty Paper, Sweet Soirée, from the 2018 Spring Occasions catalog. Card base: Old Olive 11" x 4.25"
Designer Series Paper: 4" x 5.25"; 2" x 5"
Adhere the layers of DSP to the card base with your adhesive of choice. Stamp 2 flower images in Old Olive ink and 1 in Rich Razzleberry. Then, using the light and dark Calypso Coral Stampin' Blends markers, color in all of the flowers. When finished, punch them out with the 2.25" circle punch and arrange them onto the card front, adhere the 2 Old Olive flat to the card and the Rich Razzleberry flower popped up with a Stampin' Dimensional. Finally, stamp the sentiment onto the 1" piece of Whisper White. I uses Rich Razzleberry for "Celebrate" and Old Olive for "You" and adhere that flat to the card, again with your adhesive of choice. I hope you enjoyed today's card and are finding lots of amazing ideas along the hop. Again, remember, you are currently here at Katrina's Kreative Heart with me, Katrina Wolfe, just use the link below to move along to the next site on the hop. RemARKable Ink Big Blog Hop - Valentines!